Home » Adventure » Live At Lakeview Kicks Off with The Raymond Victor Band! Live At Lakeview Kicks Off with The Raymond Victor Band! Your favorite summer music series is BACK! And this year Live at Lakeview kicks off with The Raymond Victor Band! 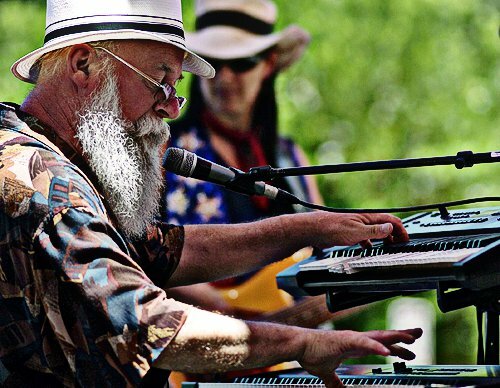 If you’re a fan of blues music, then watch out, because Raymond, his flowing white beard, and his music brigade are going to bring down the house with musical stylings that will make Miles Davis tap his toes in his grave. If you haven’t heard the RV band yet, well, you’re missing out! Raymond is from Chicago, arguably the home of blues music, and he was practically raised on a piano. He’s got 10 years of studio experience, a killer inheritance of musical genes (dad was a guitar player and mom sang and danced), and did we mention that amazing beard? And the guy can name drop. Did we say name drop? We meant name bomb. Ever heard of Stevie Wonder? Possibly? Let’s just go ahead and add Sly Stone, Bobby Womack, Larry Graham, and the BG to that list—all people he’s shared a recording studio with. 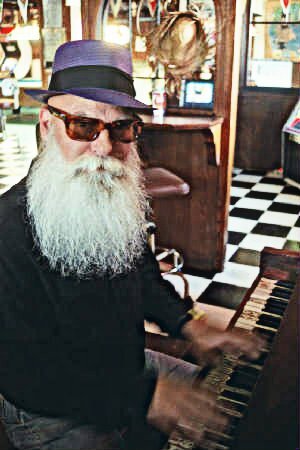 Behind that glorious beard and wicked hat lies the musical genius of blues brotha’ Raymond Vic. Buddy Miles, Garth Brooks, Buddy Guy, Canned Heat (sounds like the name of a hot sauce, right? ), and Lou Rawls—yeah, Raymond’s opened for all of them. Accompanying Raymond will be Diane Dutra, who will be rocking it on the bass, and Marcus David, who will be dropping the beats on the drums. Tons of awesome local vendors, so you can get a head start on your christmas/Hanukkah shopping. A beer garden, where you can soak your bloodstream with the tasty goodness of Coors Light and Blue Moon. Don’t forget to write mom about your charitable deeds, because proceeds from your brewski consumption will go to benefit South Tahoe BMX and Bijou Bike Park! Delicious food to nourish your tummy. First time slackliners that look like a wacky, wavy, inflatable tube-man. An assembly of 7 years olds near the stage whose dance moves put yours to shame. An undeclared contest for who can wear the craziest outfit (maybe not, but it always seems like there’s one). Also, make sure you look good, because you’re bound to run into an ex or two (ya’ll know it’s true). Lakeview commons (Corner of Lakeview Avenue & Highway 50). 4:30 is best. 5:30 is fashionably late. 6:30 means you’re a slacker. 7:30 tells me you need to get it together. 8:30 game over, better luck next time. To stay up to date on the Live at Lakeview haps, head on over to their facebook page! For some hilarious Lake Tahoe Yo Momma jokes involving a good time at Live at Lakeview, click on the link! !